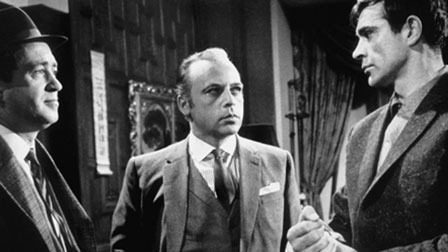 Happy birthday to Herbert Lom, who turns 95 this coming Tuesday. Born in Prague under the Austro-Hungarian Empire, he achieved screen immortality as the Chief Inspector whom Clouseau slowly drives mad in the Pink Panther films. But before that did excellent work in many high-quality films, most of which unfortunately are largely forgotten today. I have previously spotlighted his fine performance as the kindly, devout, ill-fated Gino in Hell Drivers. He has a completely different role as a cold, clever and super-smooth criminal mastermind in this week’s film recommendation: 1961’s The Frightened City. The Frightened City is a B-movie which doesn’t pretend to be otherwise. The budget is modest and so are the ambitions. But on those terms it delivers as a solid crime melodrama with a great starring role for Lom and excellent supporting work by Alfred Marks and a then little known Scottish actor who was only a year away from becoming an international superstar: Sean Connery. The film is set in the London criminal underworld. A wily financier (Lom, conveying the calm of the truly powerful in every scene) figures out that the six biggest gangs could enhance the revenue of their protection rackets by organising themselves as a syndicate. He convinces one gangster (an agreeably lubricious Alfred Marks) to head the syndicate, who in turn recruits a former burglar (Connery) to be the face of the mob to the shops, pubs and restaurants it extorts. All goes well until the gang falls out, leading to a murder that throws the syndicate into turmoil and gives a dogged Scotland Yard detective inspector (John Gregson) the chance he needs to pounce. The secondary plotline concerns Yvonne Romain as a luscious, ambitious immigrant singer who catches Connery’s eye. They have great chemistry on screen, and the script does a gratifying job of making her craftier than him rather than portraying her as a brainless tart (funnily enough Romain’s real-life husband went on to write the lyrics of several of Connery’s Bond films, including Goldfinger). The other engaging aspect of the story is Connery’s relationship to his former burglary partner (well-played by Kenneth Griffith), who has been crippled in a fall during an attempted break-in. Connery skillfully conveys the guilt he feels about the accident, and how it drives him into the hands of the new, more violent crew who are running the protection racket. The film is not without weaknesses. Some of the sets look cheap, probably because they are. The script underdevelops its theme of how crime was changing to become more violent and organised and thereby outpacing long-standing law enforcement tactics. As a result, the scenes with the police are a bit slow and stale. And John Lemont’s direction is more reminiscent of a TV show than a movie (on the plus side, if you watch this on DVD instead of in a theater, you are not missing anything). For those reasons, the film goes into the good rather than great category. As a closing note: Norrie Paramor’s jazzy title song became a big hit for Britain’s premier instrumental group of the era, the Shadows. Just for fun, you can see their totally pukka rendition of the theme on Crackerjack. Love those suits and dance steps! Regarding Connery, I just watched him as Hotspur in Henry IV (made in 1961 by the BBC). Robert Hardy (Sigfried Farnon in All Creatures Great and Small) played Prince Hal. Both performances were unremarkable as was the production. (It was a multi-part series of the history plays edited for time.) But they were both very young.